Over the past 10 years, the blockchain technology featuring decentralization, immutability, security, and transparency has revolutionalized the digital age in the same scale as internet. 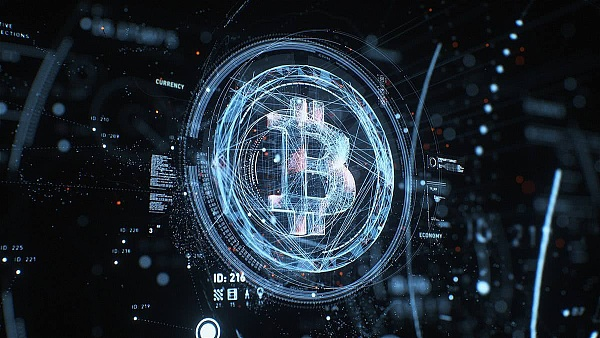 The first generation blockchain under Bitcoin was created as a medium of payment transaction and digital store of value, while the second generation blockchain under Ethereum was developed as a platform that facilitates peer-to-peer smart contracts. However, Bitcoin and Ethereum have inherent weaknesses that limit their ability for effective scaling up and meeting users’ needs due to factors such as: slow processing speed, energy costs, high transaction fees, etc. The term “smart contract” was coined by a cryptologist computer scientist, Nick Szabo, who famously said in 1994 that “a smart contract is a computerized transaction protocol that (self) executes the terms of a contract. The general objectives are to satisfy common contractual conditions.”. A smart contract is a computer software that contains rules, terms and regulations of a contract. The smart contract is self-executing, self-verifying and auto-enforcing against the agreed upon terms. It is immutable, decentralized, as well as cost saving because it eliminates the need for third parties or escrow agents. In 2015, Ethereum introduced the Smart Contract 1.0, and has leveraged its strength in dealing with various types of financial contracts. On 25th February 2019, Singapore-based startup CSE SG officially unveils the new generation Smart Contract 2.0 – featuring multi-contractual conditions and multi-industry applications running under the revolutionary, super-fast blockchain 3.0 technology. The new generation Smart Contract 2.0 has been applied to the field of finance globally, enabling ICOs, STOs and payment transactions for e-commerce. CSE SG has partnered with healthcare service providers in Thailand and Korea to apply Smart Contract 2.0 solutions to improve efficiency, traceability, transparency and security. In the agriculture sector, Smart Contract 2.0 has also been successfully applied to various projects in Vietnam, Tanzania and Nigeria, that literally “brings food from farm to table” – thus eliminating the middlemen, and helping to ensure food security, proximity, self-reliance, and sustainability of food supply. There is great potential for the new Smart Contract 2.0 platform as it only takes 15 to 30 minutes to create your own smart contract , which is directly connected to the CSE blockchain 3.0 technology through the API. You can create your crypto, access source, blockchain library, blockchain authentication for various industries such as healthcare, education, agriculture, retail, supply-chain management, energy, banking, etc. The floodgates of unparalleled innovation in business and everyday life applications have been opened with the launch of Smart Contract 2.0 by CSE SG. CSE SG is a company established in Singapore. Its has developed a proprietary CSE 3.0 technology that creates an improved Blockchain platform with breakthrough features from the application of encryption technology, blockchain foundation, blockchain pool 3.0, smart contract 2.0, artificial intelligence, internet of things, supernode cloud, etc. 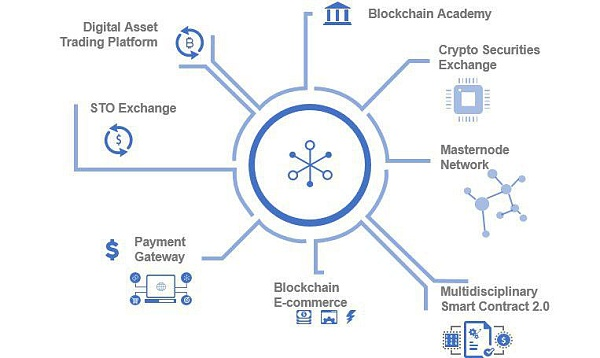 CSE 3.0 can be applied to the creation of retail payment at very low cost, super fast speed and even with no internet connectivity; applications in traceability of products; encrypting and management of information in healthcare, agriculture, education, supply-chain management, banking, and other industries. If you have any questions, please see the previous response table below. For more information, please send email us or join Telegram. Cryptocurrency is a form of payment that can be exchanged online for goods and services. As of July, about 1,690 cryptocurrencies were trading hands, and they continue to proliferate. Cryptocurrencies work using a technology called blockchain. Blockchain is a decentralized technology spread across many computers that manages and records transactions. Part of the appeal of this technology is its security. 2 What are the advantages of cryptocurrency? Easy access: You can find various projects trying to raise funds through cryptocurrency. Almost anyone that can make online fund transfers can become part of such projects. Quick and easy payments: All you need is the address of the wallet of the person or enterprise. The amount shall credit to the receiver within few seconds to a few minutes depending on the crypto. Lower Fees: Transferring money by using any other online forum or bank gateway is expensive as they levy considerable fees for the transaction. But it is not the case with cryptocurrency as the costs are nil or negligible. Private: You don’t need to share your identity or whereabouts or the details of the transactions made between you and the beneficiary. It is truly decentralized. Highly secured: All your transactions will be secure as it is using NSA created cryptography. No third party: You are the master of your money. You can keep it in your wallet and use it as per your wishes. Facilitate International Trades: The inter-country transaction is extremely easy with cryptocurrency because its function is not under the control of any central bank. This makes it easier for users to transact with it without having levies imposed on them or have their value reduced by exchange rates. 3 Why should I use CSE currency and how is it different from other cryptocurrencies? CSE is a token that runs on a new platform – 3rd platform.With the new platform, CSE addresses many of the problems that are entangled in the first and second platforms. As the number of Bitcoin and Ethereum transactions soar daily, their processing speed has become much slower. In addition, transaction fees will increase accordingly and this makes it difficult for Bitcoin and Ethereum to get into practical applications. 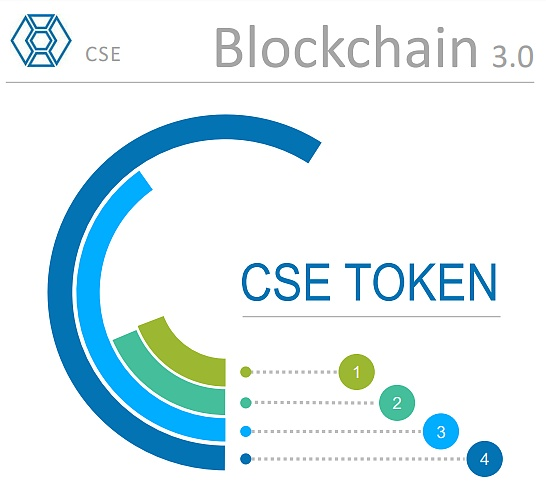 CSE is not only a third platform, but it can also create unlimited analog tokens to realize the Blockchain application dream to life with near zero charge and light transaction speed. 4 How is CSE helping entrepreneurs? Using 3rd platform, CSE can be used for retail, manufacturing, trading, banks and business. Through the ecosystem of the CSE, entrepreneurs can create their own tokens with the superiority of blockchain 3.0. 5 What are the most exciting reasons to become involved with CSE? With the ability to send money in just one second to anyone in the world through CSE wallet without spending any fees, digital currencies like CSE help to send and receive money 1000 times faster than transfers via Banks, PayPal or Western Union. 6 How do you buy/sell CSE? CSE accepts payment by 10 coins: BTC, ETH, LTC, BCH. In the future, CSE will accept payment via Paypal and Visa/Mastercard. 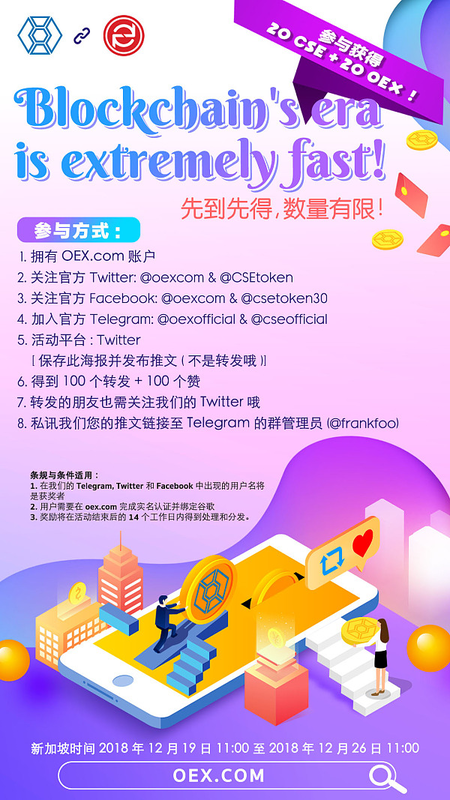 Until now, CSE has been listed on Oex.com exchange and other exchanges in the future, you can buy and sell CSE on there. 7 What benefits can I get from joining the CSE crowd funding platform? When joining the CSE crowd funding platform you will have the opportunity to own your own tokens at the cheapest cost, save time and simplify the process to create a new token. In addition, the tokens created on the new platform will also have features similar to CSE for easy payment and exchange in life. If you have any questions, or would like to open your own token. Please do not hesitate to contact us via email, we will respond as quickly as possible. After walking through Blockchain 1.0 and going through Blockchain 2.0, why are blockchain practitioners still having a bad life? As digital currencies gain recognition from more and more people, trading digital currencies is becoming more common. As we all know, although BTC and ETH have been heated up, the processing speed has become slower as the number of Bitcoin and Ethereum transactions has soared. In addition, the transaction costs will increase accordingly, which makes it difficult for Bitcoin and Ethereum to enter practical applications. The defects of mainstream digital currencies such as Bitcoin and Ethereum are becoming more and more prominent. Before 2017, Bitcoin’s transaction fees were very low and almost negligible. Proponents of the digital currency often emphasize that this is one of its main selling points. Today, in order to ensure a fast completion of the transaction, the transaction fee can usually exceed $200 at peak times. In this regard, it is clear that there are problems in some places. Although another digital currency, ETH, is better handled on the issue of transaction fees, their fees are also increasing as bitcoin transaction fees increase, but at a slower rate. According to today’s standards, Bitcoin blocks run too long and often take ten minutes to complete. 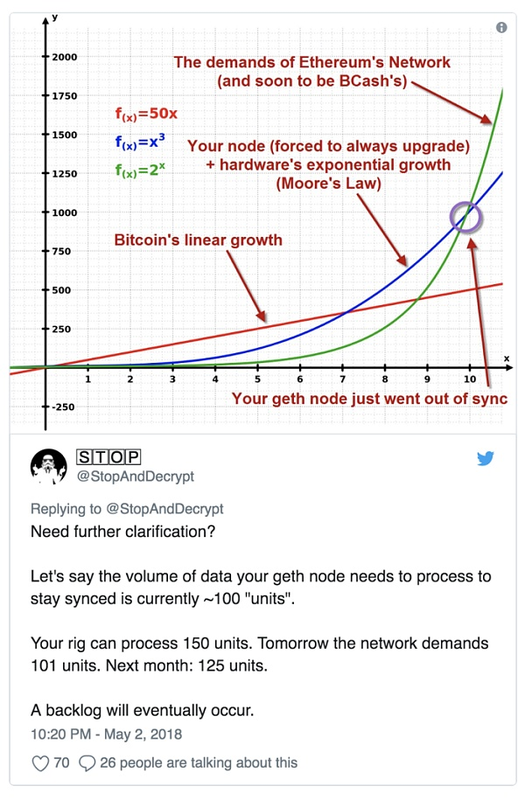 Newer blockchains and other digital currencies either have shorter runtimes or use completely different systems, such as relying on a master node or an extensibility solution. The Litecoin took only 2.5 minutes to deploy, a revolutionary initiative at the time. Although its speed is still fast enough today, it is still not up to the point. Digital currency wants to continue to develop and needs to solve the problem of trading time. Due to the fierce competition in the network charging structure of Bitcoin and the relatively long delay time, over 100,000 unconfirmed transactions in the past few days have caused frequent network congestion, sometimes as many as 250,000. Scalability refers to the ability of the blockchain to handle more and more transactions and transactions. In response to questions about scalability, Ethereum co-founder Vitalik Buterin has his own plan. Specifically, he refers to a process called sharding, and he believes that this will be the ultimate solution to the problem at least for Ethereum. In terms of bitcoin, a second-tier solution such as Lightning Network has been proposed but not yet deployed. Even the largest smart contract platform ETH dozens of transactions per second, still can not resist FCoin’s trading volume surge problem. In summary, these problems do cause people to stay away from Bitcoin and Ethereum. Despite the fact that both the BTA and the blockchain are expensive, the project prospects are very good, but the problems still remain untouched. The public chain does not solve the performance problem, and everything is in vain. How does the blockchain project really achieve its landing? However, due to the so much funding and such strong interest in these platforms, solutions will eventually emerge. Competition is also very important. It is an excellent driver of innovation. Multi-currency systems will thrive as many people support technology’s more advanced, emerging and exciting blockchain. Walk through the blockchain 1.0 project represented by BTC. After the blockchain 2.0 project represented by ETH, you will find that, in the end, how many of them actually landed with blockchain technology? Today, the Blockchain 3.0 project represented by CSE has finally entered our field of vision. CSE is the digital currency that runs on the new platform – the third platform. Through the new platform, CSE solves many of the problems entangled in the first and second platforms. CSE is not only the third platform, but it can also create unlimited analog digital currencies to realize the dream life of blockchain applications, close to zero charge and light transaction speed. And through the CSE ecosystem, entrepreneurs can create their own tokens, which undoubtedly has the advantage of blockchain 3.0. 3. Awards will be processed and distributed within 14 working days after the event ends. OEX (www.oex.com), as one of the world’s high-quality digital asset trading platforms, has been famous since its inception, with the principle of “no fraud, no evil, and deep service to users”. Known for its “high experience, high security, low threshold, low commission” and other advantages, the user base covers more than 50 countries and regions around the world. Since June 2018, its new sub-brand innovation station (www.oexvip.com) has been launched, positioning itself as an innovative board business trading platform for ecological innovation and in-depth service. The project side has self-service coins and truly realizes the “zero” currency fee. Providing opportunities for professional investors to present more innovative digital assets, and also providing a platform for the development of initial digital assets and blockchain teams, it is widely favored by innovative project parties and users. 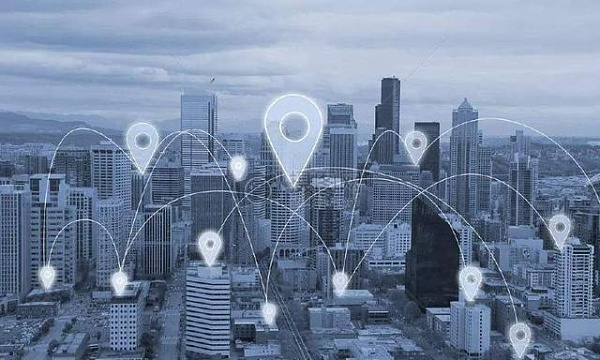 At present, the global station and innovation station have been double-site (accessible), both old and new, sharing the potential of OEX brand development.